Nicotinic acid is converted to niacinamide in the human body, involved in lipid metabolism, oxidation in tissue respiration and anaerobic decomposition for carbohydrate oxidation. It’s mainly used for medicine, food and feed additives field. In animal feed additives, its main functions are：To prevent from skin lesions and digestive diseases; to promote animal growth, improve egg production and hatching rate, to ensure good feather growth; to treat of mucosal inflammation and ulceration; Prevent from the livestock and poultry perosis. In medicine and food additives, and its main functions are：to prevent of skin lesions and digestive diseases; to promote participation in the body of material and energy metabolism, to promote human growth and development; to treat a variety of mucosal inflammation and ulcers with other drugs; Strong vasodilator effect, to improve the blood supply to the body function, feature favorable effect on cerebral thrombosis, coronary heart disease, hyperlipidemia and so on; to treat nicotinic acid , nicotinamide deficiency caused by its long-term medicament of isonicotinic acid hydrazine and analogs. 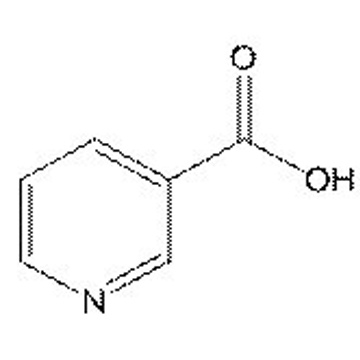 As a pharmaceutical intermediate, Nicotinic acid is used for production of isoniazid, niacinamide, nikethamide and inositol nicotinate. STORAGE: Store in original unopened cartons，to be protected from heat and light，keep away from moisture. Expiry 36 months from the date of production in original sealed packages. Once the original packages are opened, please use the goods within a short period.